This month has been focussed on the submission and approval of the first planning applications for the Middle Wichel District Centre. A number of the pre-commencement planning conditions have been approved and we have been working through the comments received on the Design Code and the first road application with our colleagues in the planning team. One of the key approvals this month relates to the landscape framework plan. We set our consultant team, LDA Design and Keystone Environmental, the tough challenge of producing a design that works for both the new residents of Wichelstowe and the existing wildlife on the site. In particular we need to consider the protected species such as great crested newts and water voles but also birds, bats and badgers. 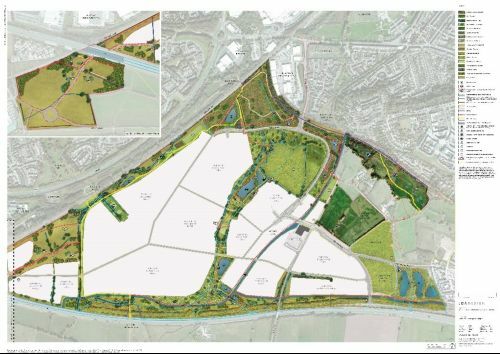 We think they have done a great job setting out a plan to create natural habitats which are also accessible via a series of footpaths and bridleways. We speak to many people who visit Wichelstowe on their daily or weekly run and are glad we have been able to identify an interesting (and flat!) 5km route around the site for future residents. The next step will be to develop detailed proposals and we will update on progress with these later in the year. The landscaping has also been one of the key challenges in the design of the first stretch of road through the District Centre. It has proved difficult to accommodate the number of trees we would like alongside the requirements for street lighting, services in the footpath, root zones and drainage. Hopefully we can find a solution that works for everyone. The selection of which street tree to use in this section of street has also been a key decision. After an initial bit of googling and a vigorous but uninformed debate in the team we consulted the experts in the Council's landscape team and settled on the Norway Maple. This was just one of a huge numbers of decisions to be made now that we are getting to the detailed design stage. A further tough choice is demonstrated by the number of pavement material samples we have accumulated on our desks and we definitely got a few odd looks from morning commuters when we were stood on a traffic island debating the choice!